This is, without a doubt, the most requested blog post from you all! I feel like every time I go to Trader Joe's I discover something new that becomes a favorite. This past week, it was there Penne Arrabbiata - we made it for dinner and it was delicious! The best part of the store (in my opinion)? Almost 90% of the items are under $5. Okay, this is going to be a lengthy one but it's well worth it! I've decided to highlight all of the items that I've tried and regularly purchase from the store when we're grocery shopping by category. Next to each I'll provide a bit more detail about where you can find them, favorite flavors or ways that we incorporate it into our weekly meals! You really can't go wrong with TJ's flowers! They are actually the longest-lasting flowers that I've purchased, so it's no surprise I now buy all of mine there. My usual favorites are their roses or hydrangeas, but their peonies and sunflowers (when in season) are also amazing! This is one area where it's hard to narrow down favorites - mainly because I try out different bottles each time. I always gravitate to the bottles with pretty labels and designs, and it usually doesn't fail! I have a few bottles unopened right now that I can't wait to try! Avocados - Although this is a basic item that you can buy anywhere, TJs avocados have always been great and super affordable. Spinach - For around two dollars, you can buy a typical-sized bag of organic spinach - that's unheard of for anywhere else around me! I love using spinach in my green smoothies and for salads. Brussel Sprouts - I typically reach for the organic bags of sprouts, or the seasoned sprouts! You can find both right next to each other - the seasoned sprouts are great if you're looking to make them with a meal one night (the portion is great) and they are seasoned with garlic, salt and pepper. Pomegranate Seeds - If you're a pom seeds fan, definitely just grab a container at the store. The size is great and they're always super fresh for salads, snacking and more. Bananas - This is definitely one of Lantz's favorite items - he eats bananas every day. At 19 cents per banana, the price can't be beat! Blueberry Goat Cheese - I LIVE for goat cheese, especially this one! While I typically keep dairy out of my diet, every now and again I love to splurge. This cheese is great for spreading and a beautiful addition for a board. Herb Goat Cheese - Another one of my favorites there at TJs - this has more of a savory taste as opposed to the sweetness of the one above. Another great option for a cheese board, and it pairs well with their multigrain crisps. Brie - Is there ever an instance where this cheese isn't the answer? They have a few different options to choose from, but their wheels are delicious and affordable for making any brie-stuffed pastry (baked brie for the win!). Blue Cheese/Goat Cheese Crumbles - These are super handy for salads when you're on the go, and you can get a decent amount for the price. I love having goat crumbles for my walnut and spinach salads. GREAT price for their eggs!! I love getting their dozen brown egg packs, or the smaller cartons for baking needs when I'm in a pinch. Chicken Sausage - Coming from a girl who absolutely LOVES bacon, I was so surprised when I tried their chicken sausage for the first time. I like using the Smoked Andouille option for a bit of flavor with my eggs in the morning, and it was mighty tasty! Salmon Fillets - If you're looking to make a fresh seafood dinner, their salmon fillets are a great place to start. You can get a large slab of salmon for a great price in their meat section - just keep in mind that the skin is still on most of these on the underside! Pesto Chicken Breasts - TJs just made your life even simpler. These ready to make chicken breasts boast their pesto flavor as a great main or flavorful addition to a pasta dish. Sparkling Lemonade (Pink and/or Limeade) - Usually next to the breads in the store you will find their sodas and other drinks. Among them you will find their line of sparkling lemonades and limeade. If you're looking for a drink mixer, mocktails option or just some refreshing bubbles on a hot day, I can't recommend these enough! The pink lemonade is my absolute favorite. Almond Milk - Like I mentioned above, I steer away from most dairy products and prefer almond milk with my cereal and smoothies. I opt for the unsweetened original flavor, but they also offer sweetened original, and a vanilla flavor. Plus, it's less than $3 a gallon. Orange/Tangerine Juice - I love both of these options at TJs! I will warn you that the tangerine juice is very fresh and sweet. So if that's not something you'd like each morning, I would opt for the orange. Cold Brew - I've only tried a sample of this, but want to buy a bottle on my next visit. It was full of flavor and a great alternative to spending extra money at the coffee shop. Clif Bars - I opt to purchase all of mine here because they are well-priced and offer more flavors that I enjoy. Salt and Pepper Pistachios - Be warned: It is very possible to eat an entire bag in one sitting. These pistachios are sooooo tasty. Raw Almonds - I love buying their bags of raw nuts to snack on during the day. They have roasted and salted options as well that are delicious. Trail Mix Packs - If you don't want to buy a full bag of trail mix (or are looking for lunch/travel size snacks) TJs offers small trail mix packs that are great for kids and travelers on the go! Cinnamon-Covered Almonds - My guilty pleasure that I never regret. These cinnamon almonds are so yummy for those trying to cut down their dessert intake or for the 3pm sugar craving that hits each day. Garlic Chipotle Salsa - This is actually my dad's favorite from the store. I used to have to buy a few each time before I visited home. A delicious salsa for any chip-and-dip lover. 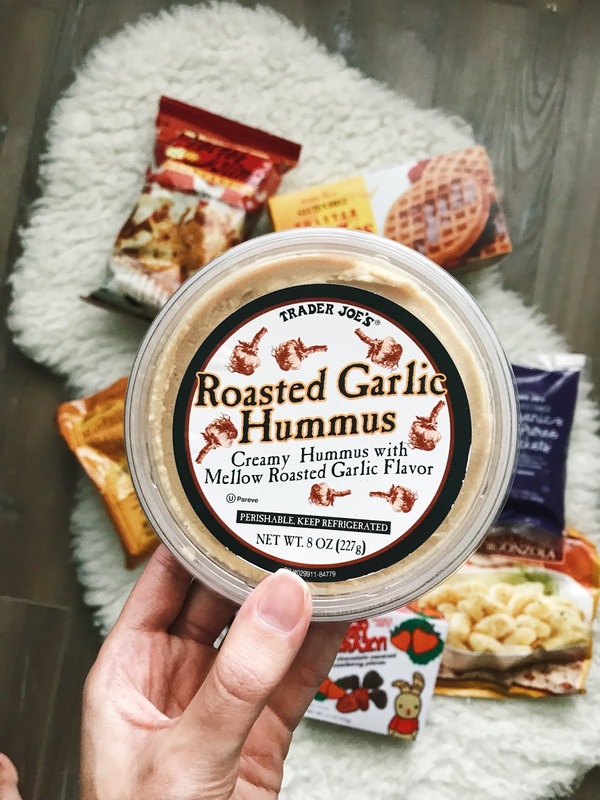 Roasted Garlic Hummus - My daily snack with pita chips! I love this flavored hummus, but they have so many options to choose from if you're curious to try others as well. These are located in the refrigerated section near the cheeses and packaged meals. Everything but the Bagel Seasoning - BUY THIS NOW. I was so skeptical before trying this seasoning, but I can't eat avocados without it now. It's the perfect combo to sprinkle on for a little extra flavor! BBQ Coffee Rub - I purchased this to try and replace an old Williams and Sonoma grilling rub that I purchased, and it's very close in comparison. Great for those who like to grill a lot and want to switch up the flavor. Minced Garlic - I cook almost everything with a bit of garlic - it's my favorite ingredient. Find their minced garlic containers next to the spices. One of the jars will last a decent amount of time. General Tso Stir Fry Sauce - Lantz and I love this sauce to switch up our chicken routine. It's super easy to use and the flavor is just amazing. Peanut/Almond Butter - For the price of a jar of nut butter these days, you'd think it was lined with gold. Thank you TJs for having raw, natural options that are much better on the wallet. Maple Agave Syrup Blend - We use this syrup on our waffles (see below for our favorite ones) for breakfast and sometimes in recipes where honey is called for. It's much lighter than regular maple syrup - but be careful, it comes out of the top fast! Alfredo Sauce - You can't go wrong with their Trader Giotto's Alfredo sauce. We use this on their brown rice and quinoa pasta often. I add a pinch of pepper on top of the finished creation! Chili Lime Seasoning - This is on my list to pick up next after trying it at a friend's house. It's bursting with flavor and is a fun addition to a basic chicken recipe. Everything Pretzel Thins - I love these for dipping in the hummus or for snacking! Pita Chips - I stick to the regular kind rather than the no-guilt fat-free ones. The texture of the regular bag is much better and at $1.99, you can't beat it. Plantain Chips - Another option that's great for dipping and serving. These are a great option for those looking for a "healthier" chip to dip in their favorite hummus. Sriracha Potato Chips - These chips are one of my TJs loves. I could eat an entire bag of these chips in 10 minutes without a problem. SO. GOOD. Do it like I do, buy them three bags at a time. Ghost Pepper Chips - If you're not a fan of sriracha, these are a great spicy chip to satisfy your craving. Olive Oil and Herb Popcorn - Though this sounds like a strange combination, this savory popcorn is a pleasant surprise. Makes for a great snack during the day rather than a buttery popcorn! Roasted Gorgonzola Oven Crisps - These crackers pair perfectly with most cheeses on your cheese platter. I love them! Brown Rice and Quinoa Pasta (GF) - This past is my absolute favorite - to the point where it tastes weird making any other brand of pasta here at home. I pair it with TJs alfredo sauce and it's great for Italian night! The pasta feels a lot lighter on the stomach (in my opinion), so that means more the merrier. Located in dry pasta aisle. Four Cheese Ravioli - This stuff is so dang delicious! We buy the jumbo size package for fun sometimes and pair with chicken. You can find these packages in the refrigerated area next to the hummus dips. Lobster Ravioli - If you're craving some pasta with a little seafood, this is an easy and yummy option! You can also find this in the area next to the hummus dips - it is a red/yellow striped pasta. Penne Arriabata - Holy deliciousness. This past is located in the frozen section, and Lantz made this as a small dinner for himself the other night. I tried a bit and it will be an item we purchase regularly now! The sauce was amazing. Gnocchi Gorgonzola - When you just want a little bit of cheesy pasta. Also in the frozen area! Sweet Potato Gnocchi - This makes a delicious side! We usually pair with a chicken dish and a green veggie. I love sweet potato gnocchi and was so happy this one lived up to the hype. Also in the frozen dinners area! 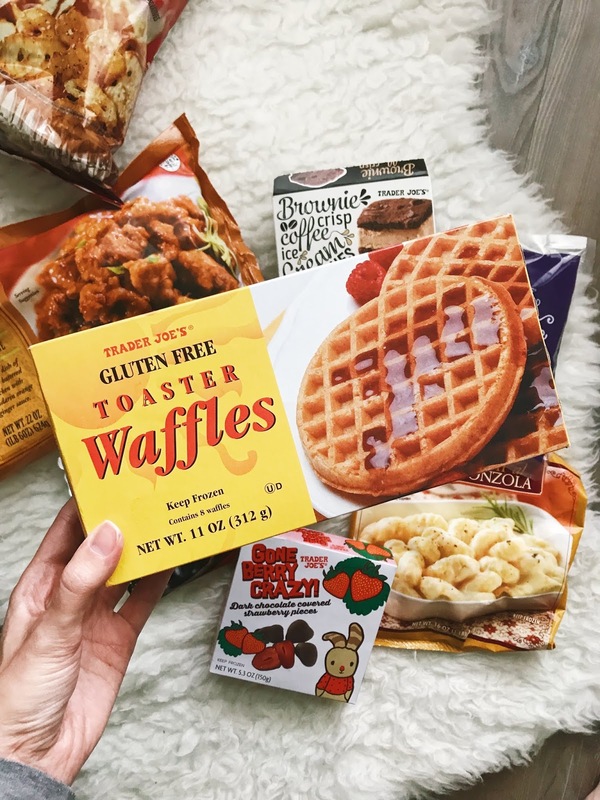 Gluten-Free Toaster Waffles - If I didn't care about my waistline, I could eat an entire box for breakfast. I'm not sure what it is about these waffles, but the texture is perfect and they taste amazing with the maple agave blend syrup. Unsweetened Acai Packets - Sometimes I prefer to make our acai bowls at home with homemade granola and toppings. 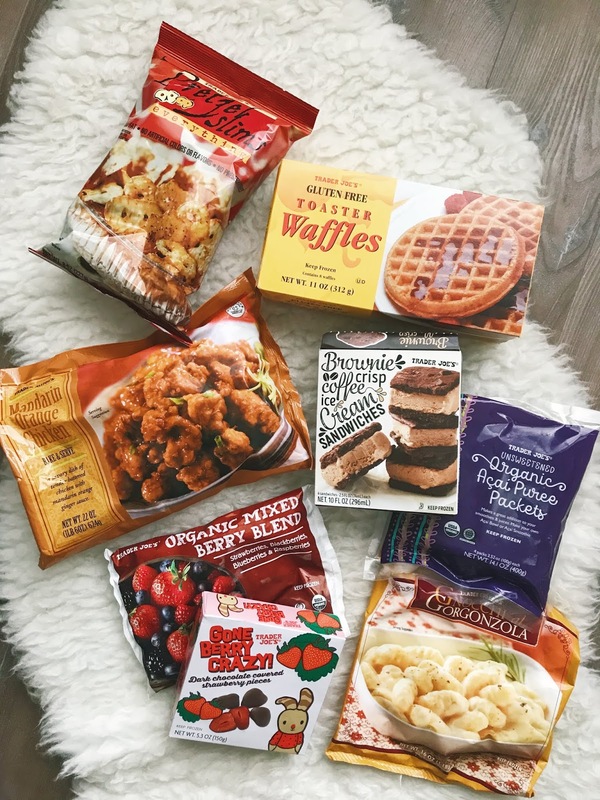 These packets are perfect and inexpensive in comparison to other stores. Organic Frozen Berry Mix - The perfect mix for smoothies and the berries are amazing! I was actually shocked when I first poured them out of the bag and realized how great they were. I'm so used to a frozen glob of berry colors, but whole berries came out and you can tell by their flavor! Mandarin Orange Chicken - A few people recommended this frozen dinner option to me for those days when you're in a jam. It's actually pretty yummy! We grab it when we're at the store and anticipate being out of town or super busy. Cauliflower Pizza Crust - Just buy it, trust me. You'll never go back to regular pizza crust. Dark Chocolate Mint Creams - Calling all York fans! These little melt-in-your-mouth drops are perfectly sized and oh so scrumptious. You'll find me popping one of these into my mouth when I'm in need of a sweet treat. Cowboy Bark - Be warned: another item you could eat in one sitting if not careful. This candy bark is a combination of chocolate, pretzels, nuts and more. Berry Crazy/Gone Bananas - Mini frozen chocolate covered banana slices and strawberry bites!!!! THESE ARE EVERYTHING. 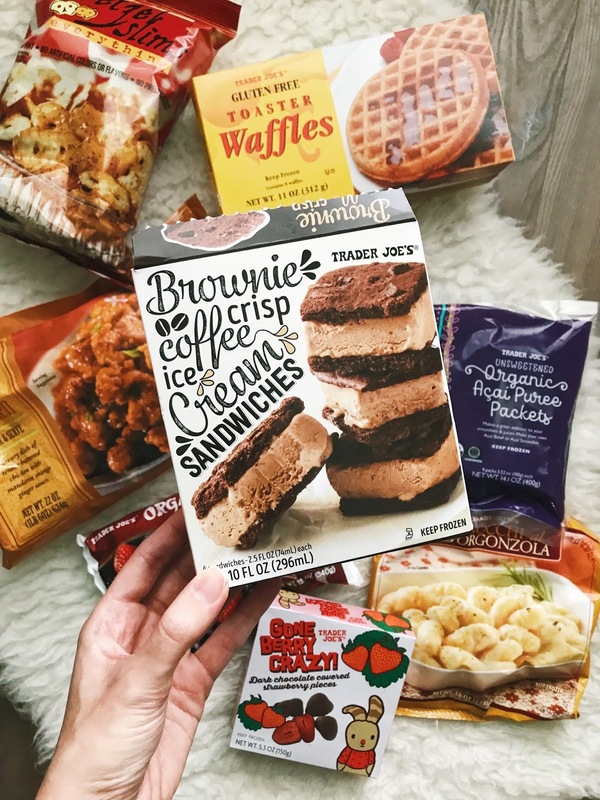 Brownie Crisp Coffee Ice Cream Sandwiches - Okay these were a game changer for me. The soft brownie shell and my favorite flavor ice cream. Sold. They are well-portioned small squares. WHEW, okay. 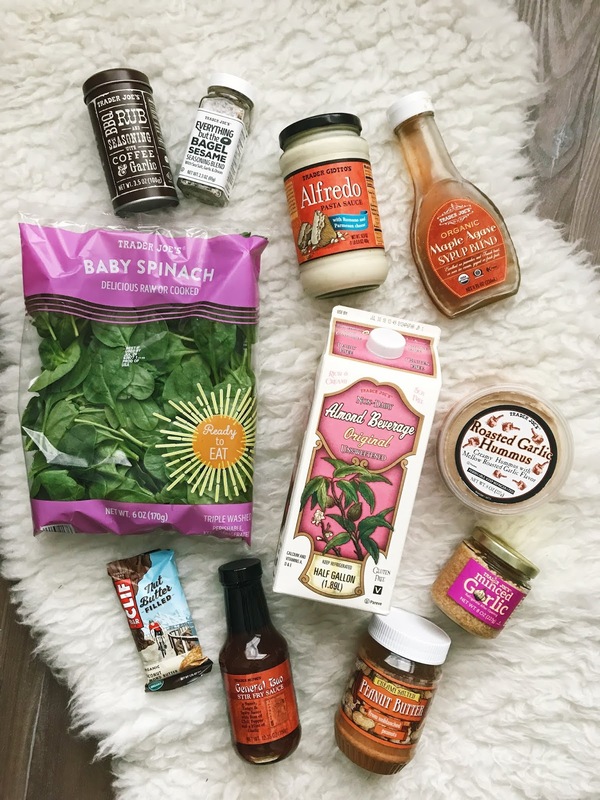 So there are all of my top picks from Trader Joe's! I will keep you guys updated as always with new additions/finds. Seriously adding a few of these to my shopping lists right away! Me too. Didn't know they carried some categories.